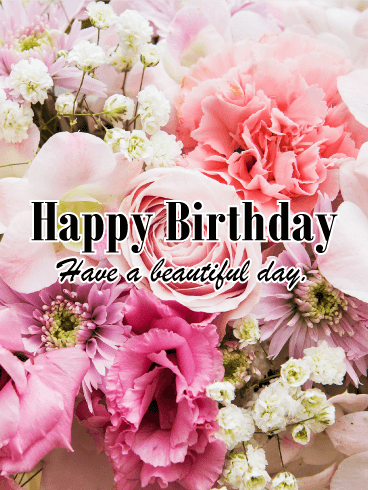 Floral birthday cards are fairly common, but not ones like these! 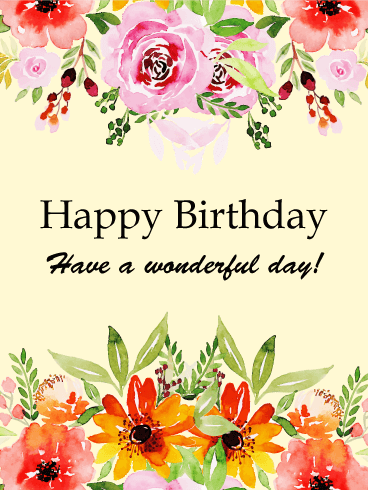 This birthday card will make the recipient feel as though they've been transported into a garden full of exotic flowers. 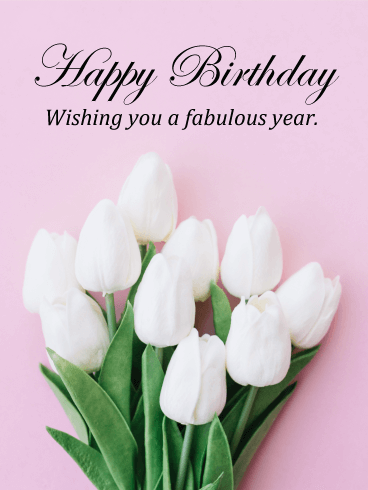 The addition of red and orange flowers really makes this card one-of-a-kind, and it's a surefire way to make the birthday guy or girl know they're appreciated and loved. 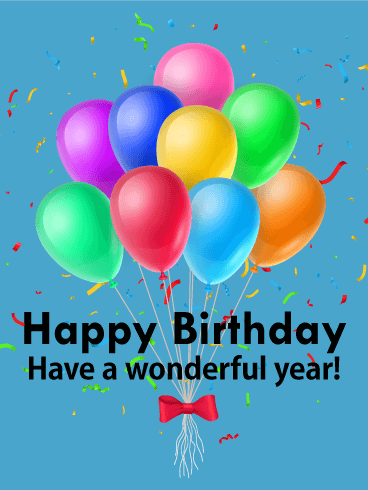 Happy Birthday - Have a wonderful day! Let someone know you're thinking of them on their big day with this bold birthday card. 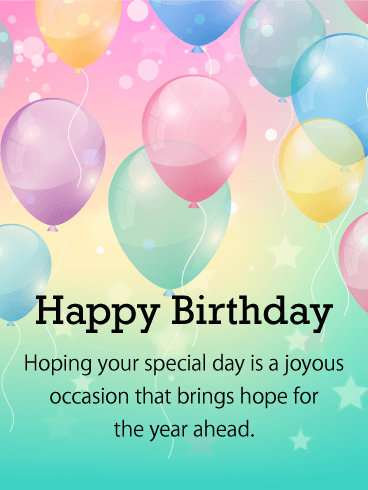 The bright-colored balloons and sparkling confetti really help this card stand out, but it's the sweet words that truly take this card to the next level. It's a great way to let someone know how special they are to you and how lucky you feel to have them in your life. This sweet birthday card is amazing in every way. 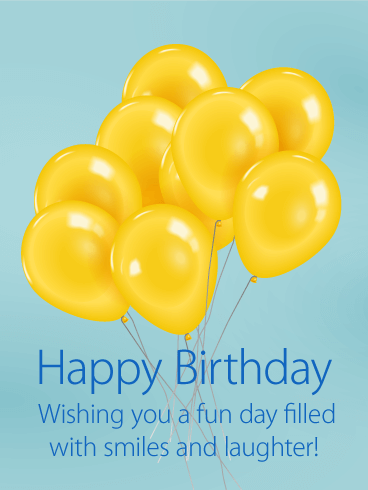 How often do you see a flawless bouquet of bright yellow balloons?! They add a pop of color to an otherwise simple card and really help make this card unique. The sentiment of this card is also sweet, wishing the recipient smiles and laughter. They're bound to love this card and you, for getting it for them. 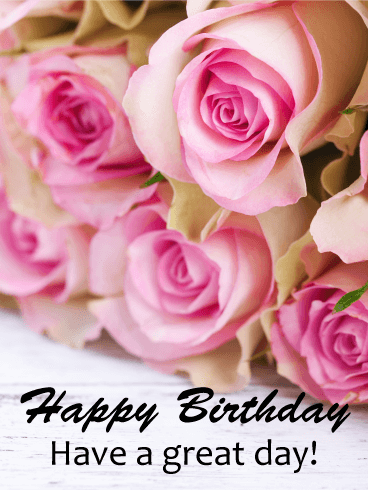 These stunning flowers are bound to bring a smile to anyone's face, and it's a great way to let them know you're thinking of them on their birthday. Just look at those gorgeous shades of pink, subtle and soft and oh so gorgeous. This birthday card offers a simple but sweet sentiment, perfect for anyone special in your life celebrating their big day. Sometimes less is more, and this stunning birthday card is a testament to that. With a soft pink background, the gorgeous white tulips really stand out. 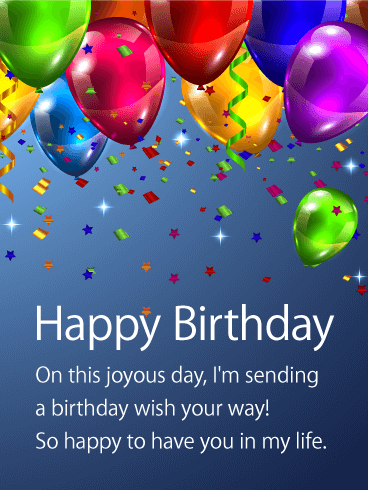 The script in which "Happy Birthday" is written adds an element of elegance, as well, while the kind sentiment of the words ties the card together. This is an classy, understated card that is a definite win. 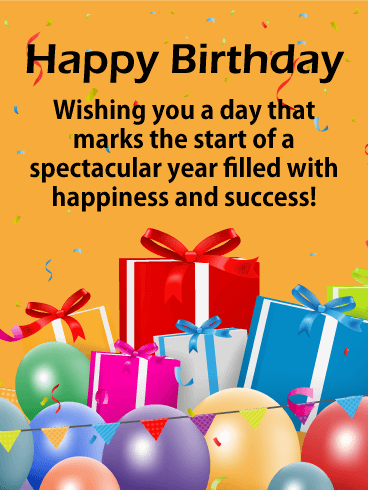 Happy Birthday - Have a wonderful year! If a bouquet full of roses is just a smidge out of your budget this year, show someone special to you how much they mean to you with the next best thing, this gorgeous, rose-covered birthday card. The pink and white coloration of the roses is truly unique, and the close-up nature really makes you feel like you've been handed a bouquet of roses. Have you ever seen such a gorgeous, soft birthday card?! The pastel colors are unlike anything else out there, with soft shades of pink and mint and lavender that add to the overall beauty of this card. The sentiment is sweet and lets the birthday gal or guy know how much they mean to you on their big day. Fireworks aren't just for the Fourth of July and New Year's Eve! The birthday of someone near and dear to you is just as important and deserving of this bright, beautiful display. 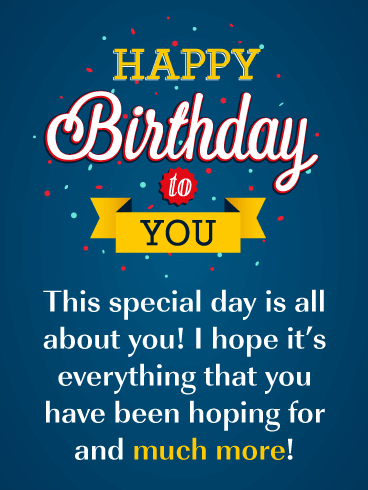 This is a birthday card that's a great choice for anyone special in your life, from a sibling to a neighbor, a best friend to a co-worker. This fabulous birthday card is the perfect balance of serious and fun. For starters, you have the variety of bright colors, with greens and blues and reds that really pop. Add in the confetti and you have a party on a card. 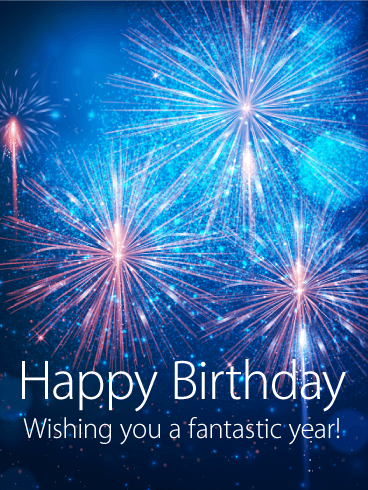 The verbiage is a nice contrast, with a sincere message about best wishes for their birthday. It's the best of both worlds. Wow! 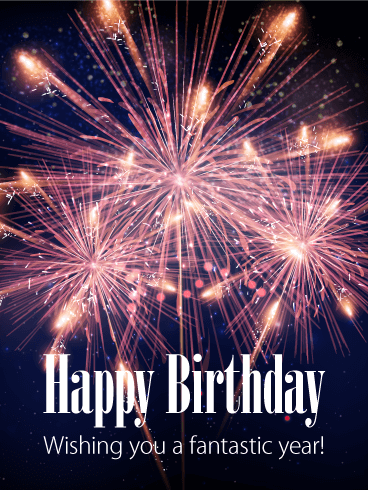 Just look at those gorgeous colors, with bright lights and sparkles to make this fabulous birthday card pop even more. 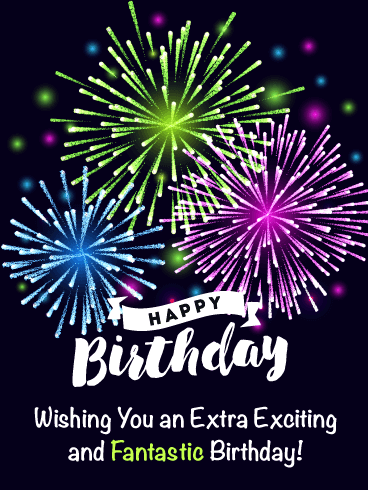 This is an awesome choice for anyone special in your life, but especially those who like to turn their birthday into a big celebration! After all, this card is truly a notch above the rest and is sure to stand out amongst all the other cards they receive.